The secret behind the success of most of the people is not what they do, but how they do it! This book discusses the life-changing concepts through storytelling. You would find yourself closely connected to these stories. They will encourage you to explore your own potential to inspire you, and to achieve your real worth. This book will also help you to understand the traits that keep you from achieving your dreams. The book lays down a process to help you emerge from the clutches of negativity and develop a positive approach towards life. By investing time in yourself, acknowledging your potential, setting a worthy goal, avoiding common traps, surviving bad days and harvesting the power of thoughts, you can be successful. Read this interesting book to Know Your Worth. N.K. Sondhi’s first book was 'Management of Banking', which draws upon his experiences as a manager in the Punjab National Bank. He then turned to fiction writing, bringing forth the seen and unseen aftermaths of the partition of India in 1947 in his novel 'Cart full of Husk'. He followed it up with a short non-fiction, 'Forgotten City of Delhi (How Delhi became Delhi)'. He wrote his next book, 'A Match Made in Heaven: A 2000-year-old love story', based on the life of an Indian princess, who became first queen of Korea in 48 AD. Working with young people as he pursued social activities after his retirement, he sensed the restlessness among youngsters, who are facing a large number of problems due to stiff neck to neck competition in every field of life. Growing use of advanced technology has further alienated them from the main stream of the society. 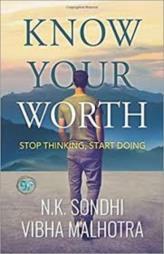 This has led him to initiate this book 'Know Your Worth' with the young and enterprising writer Ms. Vibha Malhotra. Vibha Malhotra is the founder of 'Literature Studio' and editor-in-chief of the literary e-journal 'Literature Studio Review'. In the past, she has worked as an editor with Dorling Kindersley (Penguin Random House) where she has edited beautiful coffee table books on subjects such as history, nature, fitness, lifestyle, and travel. She is also a poet and a translator. Her work has been published in literary journals across the world such as Wasafiri, Muse India, Tipton Poetry Journal, The Luxembourg Review, Red Fez, and in dailies such as The Times of India and Ceylon Today. 'Know Your Worth' is her first work as an author. Vibha holds a Master of Arts in Creative Writing from Newcastle University, UK. She teaches creative writing to all age groups. By Profession, Vibha is a Lead Software Engineer at Adobe Systems. Be the first one to review this book!